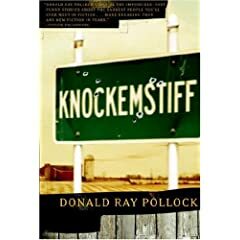 One day I was listening to NPR's Weekend Edition and heard a fascinating segment profiling Donald Ray Pollock and his new book of short fiction, Knockemstiff. The concept of the collection grabbed my interest, linked short stories are a favorite genre of mine and the author himself had a story of his own. A former paper mill worker, Pollock was publishing his first book at age 53 and brought a fresh perspective to both writing fiction as well as the publishing industry. These stories are hauntingly dark, and the characters will stay with you long after you finish the book. As far as music and writing go, though I never listen to it while I’m working on new stuff (generally in the morning), I often turn to it for inspiration when I’m revising at night. I think that’s one of the main reasons I like revision so much—I get to listen to kickass music! I grew up in the Sixties, and even out in the sticks where I lived, music was a big deal. My buddies and I might have been hicks, but we worshiped Hendrix and Blue Cheer, Joplin and the Stones, Cream and The Doors. When I’m revising something, I tend to play the same album over and over while I’m working, until I’m just immersed in the emotion of it, but not hearing the words, etc. anymore (creating, I guess, something like a “background” effect). So, in a way, if things are going well, that album becomes a part of me and my writing for a short time. Some of the words that have been used to describe my collection of short stories, Knockemstiff, include, gritty, profane, warped, rough, and sad. I guess those same words could be used to describe a blues song, and most of the stuff I listened to while revising Knockemstiff is influenced by the blues in one way or another. With that said, below is a pretty comprehensive sample of the music that I listened to while writing my first book.